The 2010/11 opera season is upon us with the promise of over 26 different opera productions announced so far in Toronto and environs over the next ten months. Rather than give an overview of all these productions, I’ll focus on the five I presently look forward to most. The 2010/11 season marks the first season planned entirely by Canadian Opera Company general manager Alexander Neef. He seems to have looked over the company’s production record to find those operas that the company has never or at least not recently produced. The first of these to arrive is Benjamin Britten’s final opera Death in Venice (1973), last staged by the COC in 1984. The opera is based on Thomas Mann’s 1912 novella about an elderly writer’s strange attraction to Tadzio, a Polish boy staying with his family in Venice before a cholera epidemic strikes the city. The COC will present the acclaimed 2007 Aldeburgh Festival production directed by Yoshi Oida, starring Alan Oke, who won kudos there as Aschenbach, and conducted by Steuart Bedford, who conducted the original production in 1973. Britten’s spare, delicate score should fare much better in the Four Seasons Centre than it could in the O’Keefe in 1984. The opera runs from October 16 to November 6. The second noteworthy opera from the COC is the Toronto premiere of John Adams’ Nixon in China (1987), an opera now performed around the world that had its Canadian premiere as part of the 2010 Vancouver Cultural Olympiad. The choice is significant for a number of reasons. First, the COC hasn’t presented an American opera since Kismet in 1987 and before that Candide in 1984. While it’s true that Canada is inundated with American popular culture, it is foolish to exclude those American works that have become accepted touchstones of 20th-century opera. There are other operas by Adams, not to mention by Carlisle Floyd, Philip Glass or Jake Heggie, that have become well-known elsewhere but have never been staged here. The COC production of Nixon in China comes from Opera Theatre of Saint Louis where it was staged in 2004 by James Robinson. He will also direct the Toronto production, which will feature Robert Orth as Richard Nixon, Adrian Thompson as Mao Tse-Tung and Tracy Dahl as Madame Mao. The production runs February 5 to 26, 2011. For more information see www.coc.ca. Toronto is fortunate among North American cities to have a resident professional operetta company, Toronto Operetta Theatre. And we’re doubly fortunate that under the leadership of Guillermo Silva-Marin, the TOT has not been content to stage only Gilbert and Sullivan or Viennese operetta, but to introduce Toronto audiences to Old and New World zarzuela, the Spanish form of operetta that is part of the heritage of an increasing North American demographic. This year TOT presents its first production of Luisa Fernanda (1932) by Federico Moreno Torroba (1891-1982). The work is often considered the last of the great romantic zarzuelas before the form, as it became increasingly political, became extinct during the Spanish Civil War. In Luisa Fernanda the action takes place in 1868 when the reign of Queen Isabel II is under threat by a revolutionary republican movement that eventually achieves success. For those curious to know more there is a 2006 DVD starring Placido Domingo as the protagonist, conducted by Jesús López-Corbos. The TOT production will be conducted by José Hernández and will star Mexican tenor Edgar Ernesto Ramirez and Canadian soprano Michèle Bogdanowicz. Luisa Fernanda plays March 9-13, 2011. This season, Opera Atelier completes its long-held goal of staging what it calls its “Mozart Six.” The sixth in this series is Mozart’s second last opera, La Clemenza di Tito (1791), that Toronto has not seen fully staged since a COC production in 1991. What makes this production especially exciting is that it reunites five of the singers that made OA’s Idomeneo such a wild success in 2008. Returning for Tito are Kresimir Spicer in the title role, Measha Brüggergosman as Vitellia, Michael Maniaci as Sesto, Mireille Asselin as Servilia and Curtis Sullivan as Publio. David Fallis will conduct and Marshall Pynkoski will direct. See www.operaatelier.com for more. Coming up sometime in 2011 (the date is still to be announced) will be the latest opera by Ana Sokolovic for Queen of Puddings Music Theatre. The work is called Svadba (The Wedding) and will be based on existing Slavic and Balkan folk tales. Sokolovic is the composer of QoP’s Sirens/Sirènes and the acclaimed chamber opera The Midnight Court from 2005 that travelled to London’s Covent Garden in 2006. Svadba, scored for six female singers, is set on the night before a fiancée leaves for her wedding while her friends keep her company with enactments of pagan rituals and peasant stories. See www.queenofpuddingsmusictheatre.com for further information. Christopher Hoile is a Toronto-based writer on opera and theatre. He can be contacted at: opera@thewholenote.com. There are two important opera stories this month: one surrounded by a plethora of media attention, and one that should be better known. The first is the North American premiere of Prima Donna by Rufus Wainwright, at Toronto’s Luminato Festival. The second is Handel’s Giulio Cesare, marking the first time Orchestra London will stage its own opera production. It is safe to say that no opera by a Canadian composer has ever received as much international media coverage as Prima Donna, the centrepiece of this year’s Luminato Festival. The principal reason is that its composer, Rufus Wainwright, is at age 36 already famous as a singer/songwriter. The son of folk-singers Kate McGarrigle and Loudon Wainwright III and brother of singer Martha Wainwright, he was born into a musical family and began touring with them at age 13. In 1998 his self-titled first album won him the accolade “Best New Artist of the Year” from Rolling Stone. In 2006, Peter Gelb, the new general manger of the Metropolitan Opera, commissioned new operas from nine composers in an effort to revitalize the Met and to draw in younger audiences. Of these nine, who included Jake Heggie (Dead Man Walking), Adam Guettel (The Light in the Piazza) and Wynton Marsalis, Wainwright had made the most progress by mid 2007. But there was a problem: Wainwright’s libretto, written by Bernadette Colomine and himself, was in French. Gelb claimed that presenting a new opera not in English was “an immediate impediment.” Wainwright, however, insisted that French was part of the texture of the work. Once the two parted company, many festivals vied to produce it. It premiered at the Manchester International Festival on July 10, 2009, with a subsequent performances in London in April 2010. Wainwright insisted that Luminato should present the North American premiere. The opera is set in Paris on July 14, 1970, and follows a day in the life of aging diva Régine Saint Laurent. She is planning her comeback but happens to fall in love with the journalist interviewing her. Wainwright, who has long been a fan of opera and whose songs are sometimes classified as “operatic pop,” has written an homage to traditional opera. Thus, audiences need not worry that this new work will also be avant garde. In Luminato’s new production, directed by Tim Albery, Janis Kelly reprises the title role with a cast that includes local favourites Gregory Dahl as the butler and Colin Ainsworth as the journalist. Robert Houssart conducts the 57-member orchestra. The opera will be performed at the Elgin Theatre on June 14, 16, 18 and 19. For more information see www.luminato.com. At the start of the month, Orchestra London takes a bold new step by becoming a producer of opera. For the past five years the orchestra under maestro Timothy Vernon has presented one opera each June at the Grand Theatre. All of these have been transfers of productions from Pacific Opera Victoria where Vernon is the artistic director. The orchestra’s first production as “Opera London” is Handel’s Giulio Cesare, directed by American Timothy Nelson, who at age 30 has already received much acclaim for his productions. Nelson is unusual as opera directors go because he is also a musician and conductor. In 2003 he founded American Opera Theatre at Georgetown University in Washington, DC, to explore his interests in movement, music, design and opera as theatre. In 2008 he was the director and conductor of Marc-Antoine Charpentier’s David et Jonathas (1688) at the Brooklyn Academy of Music and last year, among many other credits, he was the director and conductor of Purcell’s Dido and Aeneas and John Blow’s Venus and Adonis in Virginia and the director of Philip Glass’s Hydrogen Jukebox, staged as part of Obama’s inaugural celebrations. Currently he is the artistic director of the Canadian Operatic Arts Academy at the University of Western Ontario. Known for his up-to-date takes on the classics, Nelson plans to relocate the action in Giulio Cesare from Egypt to a present-day war-torn country suggesting Afghanistan. For a highly detailed look at Nelson’s thoughts behind this concept, have a look at his blog (blog.operalondon.ca), which includes video lectures and stage designs. The cast will feature the well-known countertenor Drew Minter in the title role with Lucia Cesaroni as Cleopatra, Roseanne van Sandwijk as Sesto and Ian Howell as Tolomeo. Beside the excitement that this project will bring to London, this is a rare opportunity to see Handel’s opera fully-staged in a house of only 839 seats. Performances are June 3 and 5 at 7:30 and June 6 at 2pm. For more information visit www.uwo.ca/music/operalondon. This year May is the new April. In the past, in Southern Ontario, April has seen the most operatic activity of any month of the year – but this year, May seems to have taken over that position. This month there are works from the 17th century to the 21st, most fully staged but some in concert format. Dominating the schedule are three works staged by the Canadian Opera Company. The COC’s revival of its 1996 production of Wagner’s The Flying Dutchman opened on April 24 but continues until May 20. Evgeny Nikitin sings the title role, while Julie Makarov is Senta and Mats Almgren is Daland. The original director, Christopher Alden, directs, and COC music director Johannes Debus conducts his first Wagner opera for the company. From May 1 to 30 the COC presents its first-ever Maria Stuarda, the 1835 opera by Gaetano Donizetti that premiered only three months after his Lucia di Lammermoor. Serena Farnocchia sings the title role with Alexandrina Pendatchanska as Elisabetta. Stephen Lawless directs the 2007 Dallas Opera production and Antony Walker conducts. The COC concludes its 2009-10 season with its first production of Mozart’s Idomeneo since 2001. Toronto was treated to an outstanding Idomeneo from Opera Atelier in 2008, so it will be interesting to see how this 2007 production from l’Opéra du Rhin, directed by François de Carpentries, compares. Paul Groves sings the title role, with Krisztina Szabó as Idamante, Isabel Bayrakdarian as Ilia and Tamara Wilson as Elettra, so memorably sung for OA by Measha Brueggergosman. The opera runs from May 9 to 29 and is conducted by early music expert Harry Bicket. Three more fully staged works come from smaller companies. Toronto Masque Theatre presents “A Molière Celebration.” In addition to purely spoken comedies, Molière also wrote so-called “comédie-ballets” that included interludes of song and dance often omitted in modern revivals. TMT will present the interludes written by Jean-Baptiste Lully for Le Bourgeois Gentilhomme in 1670 and those written by Lully’s rival Marc-Antoine Charpentier for Le Malade imaginaire in 1673. Soloists will include sopranos Shannon Mercer and Dorothea Ventura, countertenor Richard Whittall, tenor Cory Knight and baritone David Roth. Performances take place at the Al Green Theatre in the Miles Nadal Jewish Community Centre from May 12 to 15, directed by Derek Boyes and conducted by Larry Beckwith. Visit www.torontomasquetheatre.com for details. Two concert performances from Opera By Request fill out the month – Mozart’s Die Entführung aus dem Serail on May 7 and Carl Maria von Weber’s Der Freischütz on May 15. 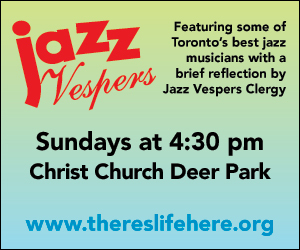 Both take place at the College Street United Church, 452 College St. See www.operaby-request.ca for details. Finally, on May 1 and 2 Toronto Operetta Theatre is holding “A Gilbert and Sullivan Extravaganza,” a gala concert of G&S highlights including high tea. All the funds raised will go to assist TOT’s 2010-11 season. TOT patrons will know that the company was forced to cancel its production of The Pirates of Penzance last month for financial reasons. One consequence of the economic downturn in the arts has been the loss of donors and sponsors. TOT was hit particularly hard when a major sponsor pulled out just before the current season began. The company had to raise emergency funds simply to stage its second show, Canada’s own operetta, Leo, the Royal Cadet, a work that TOT’s efforts had rescued from undeserved obscurity. As Canada’s only professional operetta company, as one of the few in the world that strives to present works from all the national traditions, and as a company that from the beginning has showcased Canadian singers, TOT is a gem that must be preserved. Potential sponsors and donors please take note. Visit www.torontooperetta.com for more information. Over the years April has become the most opera-heavy month of the year. Joining a full slate of old favourites from well-known companies (I’ll say more about these later) is a world premiere from an exciting young company. Indie(n) Rights Reserve presents Giiwedin (“The North Wind”), in co-production with the Native Earth Performing Arts Centre. The opera, written in the Anishnaabemowin, French and English languages, tells the story of Noodin-Kwe and her struggle to protect her ancestral land in Northeastern Ontario. It runs at the Theatre Passe Muraille Mainspace April 8-24. Librettist and co-composer Spy Dénommé-Welch and co-composer Catherine Magowan respeonded to questions I asked them, providing much insight into the opera and its background. This March, two opera companies celebrate anniversaries: Opera By Request celebrates its third, and Tapestry New Opera Works its 30th. Tapestry was part of the boom in opera in the 1980s that also saw the birth of Opera Hamilton and Opera Atelier. The more recent rise of Opera by Request (OBR) shows that the audience for opera in Toronto is still increasing. If we emphasize that these have all been full-length or one-act operas, the answer is “No.” This month OBR will present Verdi’s Un ballo in maschera on March 5, Handel’s Giulio Cesare on March 12 and Tchaikovsky’s Pique Dame on March 19. All operas are presented in concert with Shookhoff at the piano. What make OBR unusual is that all its repertoire is chosen by the singers themselves. All the box office returns go to the singers. Two or more singers will come forward with a proposal for an opera and will then seek out other singers to fill the remaining roles. What has developed is a form of co-operative, which Shookhoff likes, “because the people are there supporting one another; they’re not doing it for me.” In some cases, though, when a singer is new to Toronto or to the country and has few connections, Shookhoff will step in to take a more active part in the casting – but otherwise Shookhoff views himself primarily as a facilitator. The concept has been so successful that Shookhoff now has to restrict how many OBR shows there will be in a given year. In future he foresees creating a network of music directors who can take on a greater number of operas. While the majority of singers are recent graduates of opera programmes around the country, there are also veteran singers who have desire to perform certain roles. The singers benefit simply by being heard – which in some cases has led to contracts – and by adding roles to their repertoire, which makes them more attractive as understudies or short-notice replacements. As Shookhoff notes, “Good luck is when preparation meets opportunity.” For more information about OBR visit www.operabyrequest.ca. Meanwhile, Tapestry New Opera Works is celebrating its 30th anniversary with a special edition of its popular Opera to Go series. All five short works will be remounts from past seasons. The programme consists of The Laurels (2002) by Jeffrey Ryan to a libretto by Michael Lewis MacLennan; The Colony (2008) by Kevin Morse to a libretto by Lisa Codrington; Ashlike on the Cradle of the Wind (2006) by Andrew Staniland to a libretto by Jill Battison; Rosa (2004) by James Rolfe to a libretto by Camyar Chai; and Ice Time by Chan Ka Nin to a libretto by Mark Brownell. As usual, all five will be directed by Tom Diamond, with artistic director Wayne Strongman at the podium. The quartet of singers are Tapestry favourites: soprano Xin Wang, mezzo Krisztina Szabó, tenor Keith Klassen and baritone Peter McGillivray. The performances take place March 24-26 in the Fermenting Cellar in the Distillery District. For more information visit www.tapestrynewopera.com. According to Strongman, many considerations went into choosing which works to include. First was the desire to reflect both the range of styles of opera, and the history of the series (which has led to similar programmes in Scotland and South Africa). Second was to provide showcases for the Opera to Go ensemble. Strongman is still glowing from having been named to the Order of Canada last December, cited for “his innovative contributions as the founding artistic director of Tapestry New Opera Works; as the long-time volunteer choral director for the Regent Park School of Music; and as a champion of Canadian composers.” Congratulations for such a well-deserved honour!